Your wedding ceremony was likely planned to be touching, intimate, and a celebration of two souls finding love with one another. The reception, however, should be nothing more than a fun affair for everyone to celebrate that love with you, with the chance to also capture some cinematic footage of all of your guests. When it comes to planning your reception, you can go in quite a few directions with it. This article will offer up some ideas that can make your reception fun and a great time for everyone invited. From the very start, you can make sure that your reception is fun by taking a detailed look at your seating arrangements for everyone. There is always family or friend drama lurking in every wedding. You can make sure that the drama is averted by seating those parties far away from one another. However, you should be sure that you seat people who know each other with one another. This can encourage conversation and having a great time. No one likes to be seated with people that they don’t know, so you should do your utmost to cut down on the level of awkwardness in the reception. Everyone loves party favours. For a wedding reception, you can be as creative, silly, and fun as you want. One proven idea to get the party started is to offer everyone a small shot bottle–with actual alcohol–that has been crafted specifically for your wedding. Custom alcohol is not only a cool idea, but it also helps everyone relax and get in the party mood. Whether your guests choose to open up their party favour then and there or bring it home with them later, knowing they’re going home with a great gift is sure to make them happy and eager to celebrate your ceremony. It also doesn’t hurt to offer them some sweets or baking goods. Who doesn’t like bringing home some yummy food from a party? Those treats can also be customized with your initials to make sure it all ties back to you. 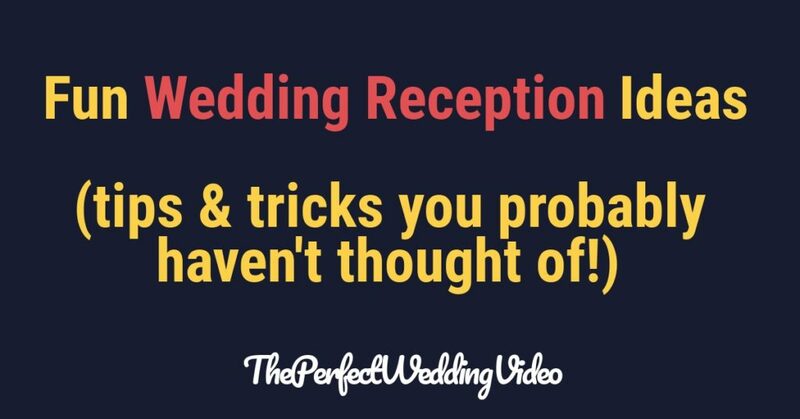 What’s the secret to having a fun reception? Keeping the length of toasts and speeches to a short duration. While toasts are a necessary part of any reception, those who are giving the speeches should be told to keep it brief. While those speeches can be quite touching, they tend to take place before the meal or before the party really gets started. When people are hungry or itching to dance, those speeches can really affect the mood of the reception. Try to have toast-bearers keep their speech short so that everyone can get to the best parts of the reception. At any wedding ceremony, you can be sure that there are going to be kids. When kids aren’t properly entertained, their parents have to do it for them. This can disrupt their own enjoyment of the party. You can help those parents out by having a kid’s table or a kid’s section where they can play, colour, and dance safely. This allows the parents to keep an eye on them while also enjoying a drink themselves and maybe even taking a turn on the dance floor. For couples who love kids, you can even feature a kid’s only song where all of the children can dance to the number. Adorableness is sure to be expected. One of the staples of a wedding reception is the first dance shared between the couple. Since you two are likely going to be dancing a lot during the night, why not have a little fun with the first one when all eyes are on you? Either by switching to a fun song, a rehearsed dance number, or even just something unexpected, you can surprise your guests and set the tone for the rest of the reception. It’s also a great way to make your first dance unique and entirely original to you. Since buffet lines are the easiest way for guests to receive their food and make sure they’re eating something that they want, you can make it an enjoyable experience by making it interactive. Perhaps they need to decorate their own mini cake or salad. For bars, you can have a cocktail station where guests can make the next big hit for delicious and powerful alcohol samplers.